We are pleased to report an increase in the demand for color-customized glass used to brand building exteriors and interiors. Companies working to strengthen their corporate brands amidst growing global competition are increasingly using architectural glass to brand key physical environments, such as their retail spaces and corporate HQs. Public and shared areas – facades, lobbies, meeting rooms – are among the leading architectural applications, presenting the most visible and effective color-branding opportunities. According to our design experts, demand is spurred by the competitive commercial market, in combination with recent architectural glass technological developments that deliver more accurate custom colors with long-term durability. At New York’s recently opened Pier 17 South Street Seaport by SHoP Architects, four-story-tall light boxes feature our custom textured channel glass with colored LED back-lighting. The light boxes function as a ventilated rainscreen facade over a traditional glass curtain wall. Custom-profile channel glass with deeper flanges reaches 20-foot continuous heights and spans across elevations without the need for mid-point wind clips, creating a seamless lighting effect. 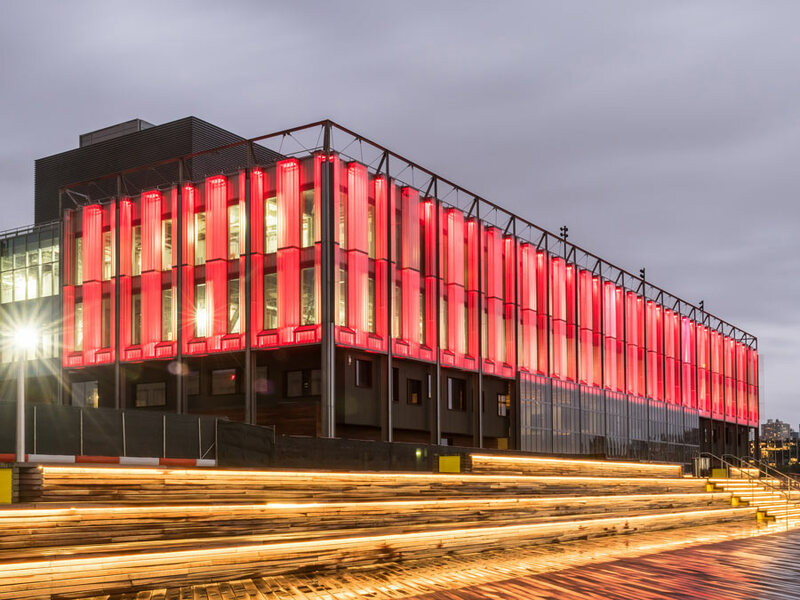 Illuminated in red – ESPN’s brand color – the facade celebrates the sport network’s new broadcasting center on the Pier. Photo by C. Taylor Crothers Photography, Inc. In the first and only installation of vertically-unitized, multi-colored ceramic-fritted channel glass in North America, the Children’s Hospital of San Antonio features a vibrant colored glass facade that corresponds to the hospital’s new brand identity. The cheerful translucent hues are visible during the day and night, and contribute to the young patients’ improved mood and healing process. The unitized glass façade elements were collaboratively designed by Overland Partners’ architects and our technical design team, and installed by Sharp Glass. Photo courtesy of the Children’s Hospital of San Antonio. Colored laminated glass partitions highlight shared meeting areas, while maintaining Cannon Design’s open floor plan. The vibrant warm hues of the glass align with IAAI’s signature color palette, branding the space and adding energy to the design. A custom colored glass lobby wall creates a millennial-inspired design highlight – in a bright pink hue matching the midtown Manhattan hotel’s brand color. The custom laminated glass shifts from clear to translucent, creating a sense of mystery and discovery. Designed by Gabellini Sheppard Associates and installed by Empire Architectural Metal & Glass. Photo by Anna Lorente. Designed by TPG Architecture, back-painted glass in British Airways’ signature “Midnight Blue” creates an expansive entrance wall, helping passengers easily locate the lounge. The glass is produced with our proprietary HardShell® color coatings for added durability and UV-stability. The coatings are baked-on at approx. 600 degrees Fahrenheit to ensure superior adhesion, allowing the glass to be handled and installed without damaging the color. They can be used to produce 100% VOC-free glass surfaces in the entire spectrum of color – from custom hues to ultra-brilliant whites and luminous metallics. Recent developments in our architectural glass manufacturing include growing fabrication capacities that allow speedier production of customized glass products. A combination of exacting, proprietary color formulas and spectrometer calibration processes is used to achieve the fine tonal changes necessary for precise color matching. Simultaneously, the inherent durability and maintenance benefits of architectural glass make it a preferred “branded” building material, especially for high-traffic exterior and interior spaces.